Nanoparticles of the ZnO and TiO2 were synthesized and the physicochemical properties of the compounds were characterized by IR, X-ray diffraction (XRD), scanning electron microscopy (SEM) and transmission electron microscopy (TEM). The XRD patterns of the ZnO and TiO2 nanoparticles could be indexed to hexagonal and rutile phase, respectively. Aggregated nanoparticles of ZnO and TiO2 with spherical-like shapes were observed with particle diameter in the range of 80-100 nm. These nanoparticles were used for photocatalytic degradation of various dyes, Rhodamine B (RhB), Methylene blue (MB) and Acridine orange (AO) under solar light irradiation at room temperature. Effect of the amount of catalyst on the rate of photodegradation was investigated. In general, because ZnO is unstable, due to incongruous dissolution to yield Zn(OH)2 on the ZnO particle surfaces and thus leading to catalyst inactivation,the catalytic activity of the system for photodegradation of dyes decreased dramatically when TiO2 was replaced by ZnO. With the development of the textile industry, intense concerns were focused on the contamination of the environment caused by dye pollutants, which caused severe environmental pollution and health problems due to the variety, toxicity and persistence characteristics [1-6]. Most of dyes are characterized by complicated constitution and high chemical stability, hence persist for long distances in flowing water, retards photosynthetic activity, inhibit the growth of aquatic biota by blocking out sunlight and utilizing dissolved oxygen and also decrease the recreation value of stream . Therefore degradation of the dyes in industrial wastewaters has generated considerable attention due to their huge volume of production, slow biodegradation, low decoloration and high toxicity [8-11]. Metal oxides can adopt a vast number of structural geometries with an electronic structure that can exhibit metallic, semiconductor or insulator character and therefore play a very important role in many areas of chemistry,physics and materials science [12-16]. In recent years, an enormous interest has been devoted to heterogeneous photocatalysis using metal oxides owing to its potential applications to both environmental applications and organic synthesis [17-21]. Many attempts have been made to study photocatalytic activity of different metal oxides such as SnO2, ZrO2, CdS [22,23]. Titanium dioxide (TiO2) and zinc oxide (ZnO) that are characterized by chemical stability, environmentally friendly, no toxicity and cheap production cost, are used in a large variety of different fields of photochemistry ranging from large-scale products to more advanced applications, for example, in environmental remediation, photo-electrolysis of water and dye-sensitized solar cells [24-27]. Sunlight is abundantly available natural source of energy which can be conveniently exploited for the irradiation of semiconductors in the photodegradation of pollutants and can make the process economically more viable [28,29]. Dyes can be degraded in the presence of photocatalyst upon irradiation with visible light because of their absorption in the visible region. In the present study the degradation of the three dyes Rhodamine B (RB), Methylene blue (MB) and Acridine orange (AO) were investigated using solar light irradiation and the efficiencies of various metal oxide catalysts were compared (Scheme 1). With using TiO2 and ZnO nanoparticles as a photocatalyst under solar irradiation, the effects of different operational parameters on the degradation of dyes were studied. Chemicals and solvents were purchased from Merck and Sigma-Aldrich and were used without further purification. Nanoparticles of ZnO were prepared using a polyethylene glycol (PEG) sol-gel method. Zn(NO3)2.6H2O, ethanol, and PEG (Mw = 1000) were used as starting raw materials. 1.0 g of Zn(NO3)2.6H2O was dissolved in the transparent solution of PEG (1.5 g) and ethanol (20 ml) with constant stirring at 150 °C until a viscous gel was formed. Viscous gel was dried at 350 °C for 30 min. To obtain ZnO nanoparticles, the resulting dried porous precursors were ground into powder and calcined in air at 600 °C for 6 h.
The controlled hydrolysis of titanium isopropoxide under ice-cold (0 °C) condition with vigorous stirring gives white precipitate of TiO(OH)2. The precipitate was washed several times in distilled water and then dissolved in nitric acid to get a clear, transparent titanyl nitrate [TiO(NO3)2] solution . Aqueous solution of 1:1 molar ratio of titanyl nitrate and urea were taken in a 250 ml beaker and introduced into a muffle furnace maintained at 673 K. Solid products were obtained within 2 h of total preparation time. Experiments were carried out under solar light. To 50 ml of dye solution (10 mg l-1), 10 mg of catalyst was added and suspension was subjected to solar light irradiation. The aqueous suspension was magnetically stirred throughout the experiment. For a given time interval, a small quantity of the mixture solution was pipetted into a quartz cell, and its absorption spectrum was measured using an UV-Vis spectrophotometer. XRD patterns were recorded for nanoparticles to determine structure and phase formation of ZnO and TiO2 photocatalysts (Fig. 1). XRD patterns of the ZnO show peaks at the positions of 31.75°, 34.38°, 36.21°, 47.44°, 56.35°, 62.73°, 66.27°, 67.79° and 69.10°, which are in good agreement with the standard JCPDS file for ZnO (JCPDS 36-1451, a = b = 3.249 Å, c = 5.206 Å, α = β = 90° and γ = 120°) and can be indexed as the hexagonal wurtzite structure of ZnO having space group P63mc . The structure of ZnO is characterized by two interconnecting sublattices of Zn2+ and O2-, and each Zn ion is surrounded by a tetrahedral of O ions, and vice versa. Also XRD pattern of TiO2 nanoparticles could be indexed to rutile phase of titania. The samples consisted of a pure ZnO and TiO2 phases with no possible impurities. Fig. 1. XRD pattern of a) TiO2; b) ZnO nanoparticles. Fig. 2. IR spectra of TiO2 and ZnO nanoparticles. Figure 2 shows the FT-IR spectra of the synthesized ZnO and TiO2 nanoparticles. The peaks at ν = 617 cm-1 and 435 cm-1 are related to the stretching vibrations of Zn-O bonds . Also, TiO2 nanoparticles show broad band in the region of 400-900 cm-1 due to unresolved stretching vibrations of Ti-O-Ti. The weak peak at 1620 cm-1corresponds to the bending vibrations of O-H, and the broad band at around 3427 cm-1 are attributed to the surface adsorbed water and hydroxyl groups . 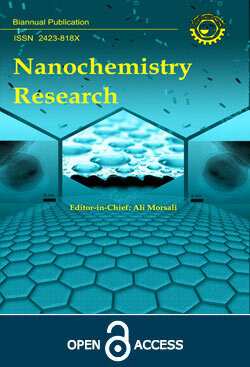 Particle morphology and textural properties of ZnO and TiO2 catalysts were also studied carefully by SEM and TEM. Representative SEM and TEM images recorded for ZnO and TiO2 materials are shown, respectively, in Figs. 3 and 4. Aggregated nanoparticles of ZnO and TiO2 with spherical-like shapes are observed with particle diameter in the range of 80-100 nm. Fig. 3. SEM images of a) TiO2; b) ZnO nanoparticles. Fig. 4. TEM images of (a) TiO2; b) ZnO nanoparticles. Photodegradation experiments were carried out under irradiation of the dye solution under solar light (~400 W m-2). The extent of dye degradation was monitored using UV-Vis spectroscopic techniques. The first photo-degradation of Rhodamine B (RB) by various metal oxides as a photocatalyst was investigated. In the absence of a photocatalyst, the photodegradation of RhB under solar light irradiation was very slow, and almost no degradation of RhB was observed after 120 min. But When the TiO2 catalyst was added to the RB solution under solar irradiation, the degradation of RB was complete after 35 min, showing that TiO2 facilitated the degradation of RB by solar light (Fig. 5a). The catalytic activity of the system decreased when TiO2 was replaced by ZnO and loss of RB took more than 120 min (Fig. 5b). TiO2 is the most promising photocatalyst as it is chemically inert and stable with respect to photocorrosion and chemical corrosion, but ZnO is unstable due to incongruous dissolution to yield Zn(OH)2 on the ZnO particle surfaces and thus leading to catalyst inactivation . Other catalysts, MoO3, WO3, RuO2, Co3O4, α-Fe2O3, Mn2O3 and Fe3O4 have negligible activity. Fig. 5. Changes of UV-Vis spectra during the degradation of RB on a) TiO2; b) ZnO under solar light irradiation. 50 mg catalyst; 50 ml RB (10 mg l-1). As shown in Table 1, the amount of catalysts TiO2 and ZnO could also significantly affect the rate of degradation of RB. When the amount of catalysts TiO2 and ZnO were increased from 0.01-0.05 g, the time for complete RB degradation was reduced from 70 min to 35 min and 360 min to 120 min, respectively. In final, photocatalytic activity of ZnO and TiO2 nanoparticles was evaluated by degrading two other dyes, MB and AO in aqueous suspensions under solar light irradiation at room temperature. In Fig. 6, UV-Vis spectra after different illumination times of a MB solution with TiO2 and ZnO catalysts are shown. As can be seen from the figure, the maximum absorption peak at 663 nm gradually decreases during the illumination and the removal of MB for two catalysts are complete after 50 min. The reaction in the absence of solar light irradiation, confirmed that adding only TiO2 or ZnO catalyst into the solution within 60 min, little removal of MB (about 5%) occurred, indicating that the effect of adsorption on MB removal is not obvious (Figs. 6c, d).